Red kidney beans, shelled edamame, white kidney beans, and soybeans. The white kidney beans and soybeans are from Hokkaido. Can be eaten as a snack, or used in salads, soups, or stews. 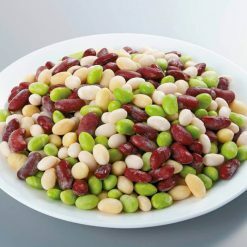 This mixture of red kidney beans, white kidney beans, soybeans, and shelled edamame is great for use in stews, soups, salads, or even eaten as a snack. Making dishes using multiple kinds of bean can be highly time-consuming if you use dried beans, and needing to open many cans of beans to get a little of each type can be tedious. Using Sugarlady’s bean mix can save time as well as cabinet space! Beans are a good source of protein, especially for vegetarian or vegan diets. In addition, edamame contain manganese, vitamin K, and copper, and red kidney beans contain lean protein. Both red and white kidney beans contain folate. 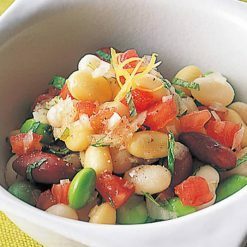 Aside from being an essential ingredient in chili and stews, beans can also be added for flavor and variety to salads. Without defrosting the package, take out the portion of beans you will be using, place in hot water, and boil for 2 to 3 minutes. Alternatively, put the beans in a bowl, cover the top of the bowl with plastic wrap and microwave for approximately the amounts of time listed below. Thaw in a 500W microwave for 2 minutes, or in a 600W microwave for 1 minute 40 seconds. Then, add a little bit of salt and eat as a snack! You can also use the beans in salads or with sauce. The beans can be added frozen to soups and to stews. This product contains red kidney beans (China), white kidney beans (Hokkaido), soybeans (Hokkaido), shelled edamame (China). Origin of ingredients: Red kidney beans, edamame (China), white kidney beans, soybeans (Hokkaido). Prepared and packaged in Japan.